Neurodegenerative disease is becoming the leading cause of death around the world. Brain disease among wildlife is a canary in the proverbial coal mine. Although there are many vectors for wildlife to contract prion disease, the biggest prion pathway in the world is being ignored. Alzheimer’s disease alone is killing 50-100 million people now. Millions more will contract the disease this year, while just as many will go undiagnosed and misdiagnosed. Thanks to misinformation and the mismanagement of infectious waste and bodily fluids, people of all ages are now exposed to an expanding spectrum of brain disease. So are other mammals. The most common forms of neurodegenerative disease include Alzheimer’s disease, Parkinson’s disease, ALS and Creutzfeldt-Jakob disease–the most aggressive and infectious of them all. According to Nobel Prize Laureate Stanley Prusiner, these brain diseases are part of the same disease spectrum—prion disease. It’s also known as transmissible spongiform encephalopathy (TSE). The operative word is transmissible. Many factors are contributing to the epidemic. Unfortunately, it appears that Alzheimer’s and Parkinson’s are just as infectious as Creutzfeldt-Jakob disease (CJD). The bodily fluids of people with prion disease are infectious. Prions are the X factor in the global epidemic. Prion disease is a spectrum disease that varies in severity. It also varies depending on which region of the brain is impacted first. It affects most, if not all, mammals. Prion disease causes memory loss, impaired coordination, and abnormal movements. Prions are an infectious form of glycoprotein that can propagate throughout the body. TSE surveillance is important for public health and food safety because TSEs have the potential of crossing from animals to humans, as seen with the spread of mad cow disease. TSEs also have the potential of being transmitted from humans to animals. The most common example is chronic wasting disease (CWD) among deer species. Sick wildlife are a canary in the proverbial coal mine. CWD is part of a larger epidemic of neurological disease that is killing people, wildlife and livestock around the world. The warning signals are being ignored. CWD was first detected in deer in North America. Then it was detected in a variety of other animals, including an elephant at the Oakland zoo. It’s been found in a variety of animals across the United States and Canada. All hypotheses seem to center around contaminated feed and deer farmers. Then the deer spread the disease via nose-to-nose contact. Those theories were just rocked by the discovery of CWD in Norway in moose and reindeer. The disease didn’t jump the Atlantic from the Americas. However, Norway dumps tons of infectious waste on land every year–infectious waste from people with prion disease. It’s not known which patients with brain disease become infectious or when. The medical community prefers to ignore the topic. The legal industry is about to have a bonanza because negligence is the rule and not the exception regarding Alzheimer’s disease and the mismanagement of infectious waste. Savvy neurologists won’t touch patients with these symptoms because of the risks. Unfortunately, caregivers aren’t warned accordingly. Prions are unstoppable. The pathogen spreads through the bodily fluids and cell tissue of its victims. The blood, saliva, mucus, milk, urine and feces of victims are infectious. Wastewater treatment doesn’t touch prions. In fact, these facilities are now helping incubate and distribute prions via solids and wastewater released. Once unleashed on the environment, prions remain infectious. They migrate, mutate and multiply as they infect crops, water supplies and more. Unfortunately, prions linger in the environment, homes, hospitals, nursing homes, dental offices and beyond infinitely. Prions defy all attempts at sterilization and inactivation. Scientists have shown that infected tissues can transmit prion disease between animals. There is no species barrier. A new study published in the journal Nature renews concern about the transmissibility of Alzheimer’s disease between people. A second study by the same scientist in early 2016 adds to the stack of evidence. 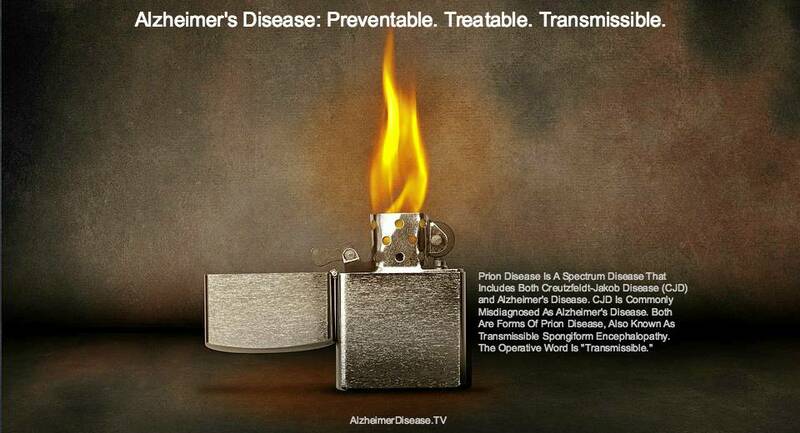 There is no evidence that Alzheimer’s disease is not infectious. The risk assessments prepared by the U.S. EPA for wastewater treatment and sewage sludge are flawed. Many risks are not addressed, including prions and radioactive waste. They don’t mention prions or radiation because there is no answer. Most nations are making the same mistake. Failure to account for known risks is negligent. Crops for humans and livestock grown grown in sewage sludge absorb prions and become infectious. We’re all vulnerable to Alzheimer’s and other forms of prion disease right now due to widespread denial and mismanagement. Sewage treatment plants can’t detect or stop prions. Just ask the U.S. EPA. 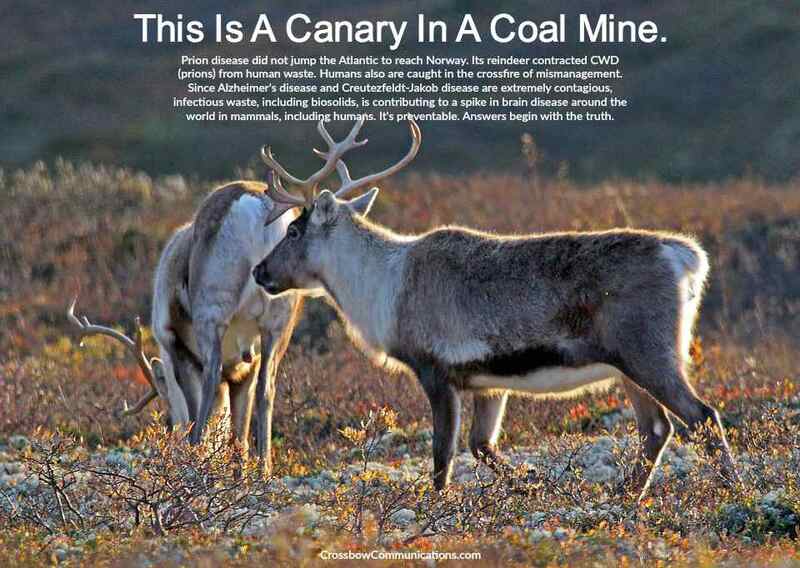 If sick deer are serving as a canary in a coal mine, what is this infectious waste doing to livestock and humans? It’s time to stop the land application of sewage sludge (LASS) in all nations. Safer alternatives exist.